Home Entertainment Featured Celebrity Heart Evangelista News Is Heart and Chiz getting married on 2014? 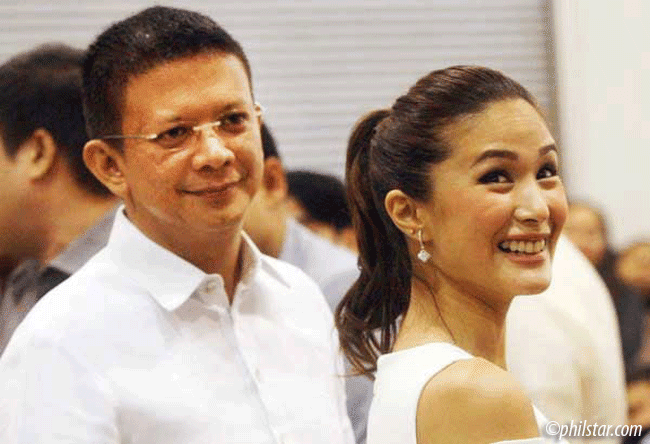 Is Heart and Chiz getting married on 2014? This couple went through so many controversies that put their relationship under test. The involvement of the family of Heart Evangelista up to the integrity of ChizEscudero being a partner was discussed during those moments. With so many left and right allegations, we can do nothing but wait for further news about what would happen on the situation of the two. And here comes a news that might or may not happen this 2004. There was a very heartfelt and sincere conversation between Heart Evangelista and Startalk hosts that revealed Heart’s plan for her relationship with Chiz Escudero. She was even asked if she is willing to marry Chiz and she answered “yes” boldly. There was confidence in their every answer to every question which may give us a hint of what will happen this year that has something to do with the couple’s decision. Meanwhile, the two did not set the date yet and that is something that we will surely look forward to. Getting married is probably the conclusion of everything between the two thought they will have to go through a lot of things. Heart and Chiz deserve to be happy andcontented in life. They are both prominent personalities. Heart is a model and celebrity. On the other hand, Chiz is a politician – an influential leader. They will make a good partnership if they do.